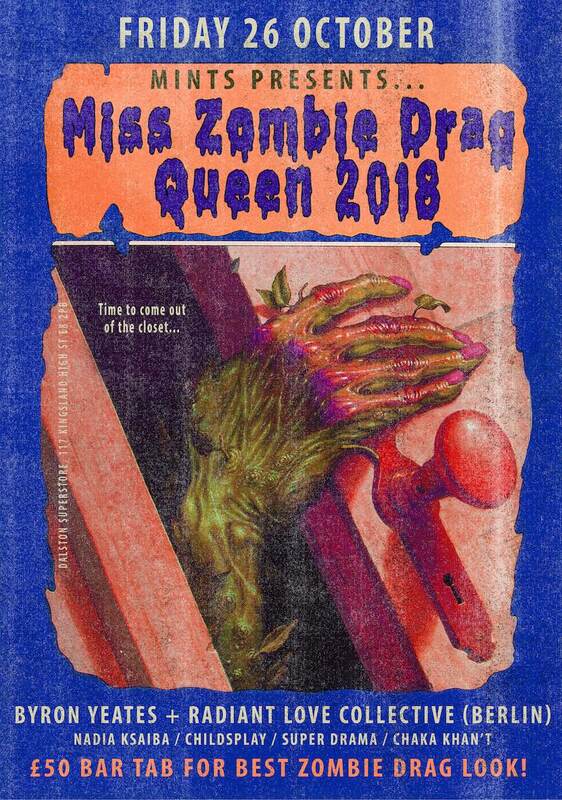 Alright you bunch o’ freaks… All-nonsense femmesexual discotheque Mints turns undead this October for a very special All Hallow’s Eve blowout at Miss Zombie Drag Queen 2018! Who will win the coveted crown?! Get your looks ready, ’cause this is gonna be a bloody battle royale! featuring: SPOOKY DJS! PRIZES FOR LOOKS! ZOMBIE WALK OFF™! EVERYTHING YOU COULD EVER WANT!!!!! Downstairs, Berlin wunderkind Byron B Yeates serves up a special Halloween slurry of techno and house with local boys Super Drama, while Nadia Ksaiba, Childsplay and Chaka Khan’t keep things undead on the top deck! Hosted by local drag witches the Mints Dance troupe PLUS Radiant Love Collective (Berlin)!